The combo kit does its job and does it well. 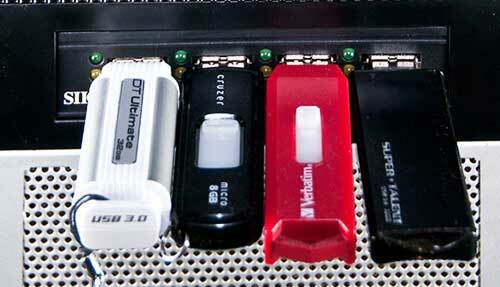 It adds four front USB 3.0 ports to your rig without needing to snake cables outside your case. It is however limited by its PCI Express x1 interface. As you can see, this combination kit consists of two separate but equally important components. 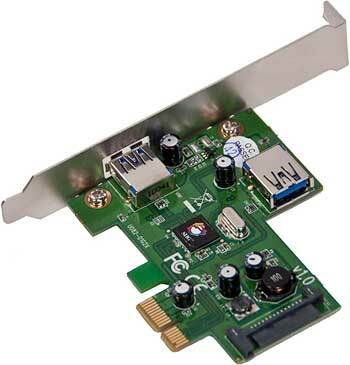 The first is a fairly typical looking, NEC / Renesas-based PCI-E x1 interface SuperSpeed USB adapter card, just one which uses a fairly non-standard SATA power port for additional power input rather than a MOLEX connector. While the power interface is different, what really makes this card special is the addition of an internal USB 3.0 header port; albeit it still is a “external” style port and not a true internal port. This means that you can use any USB 3.0 cable you own to connect to front USB 3.0 port(s), but as time goes by its usefulness will diminish. Of course, as time goes by motherboard and cases will start coming with “proper” internal USB 3.0 headers and front panel connectivity options so this niche will disappear. In the mean time, this small card is one special USB 3.0 adapter card that makes it very impressive. Though without the other half of this combination 2-in-1 kit, the USB 3.0 PCI-E adapter card by itself, is not all that useful and this is where the other half comes into play. 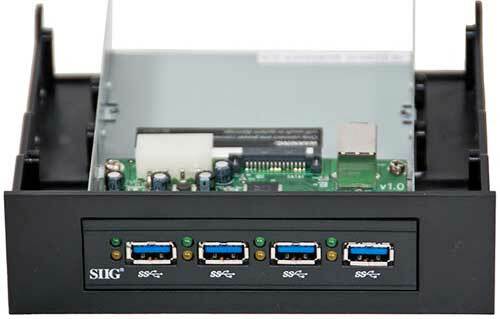 Much like the SIIG external 4 port USB 3.0 hub, I recently looked at, the 4 port 3.5″/5.25″ bay hub uses a single USB 3.0 port and turns it into FOUR via its use of a single VIL810 controller chip. Since the PCI Express card which makes up the other half of this combination kit has an internal USB 3.0 port, this means you do not have to snake a cable outside your case to get four front mounted SuperSpeed USB ports. The other nice thing about this hub is that it is in fact a 3.5″ bay hub that comes with a 5.25″ bay adapter. What this means is you can use it in either a free “floppy drive” bay on your case OR a 5.25″ bay. This makes this hub VERY flexible and very easy to install. Also nice to see, is much like the SIIG external hub I looked at awhile back, this bad boy is powered a hub. Unlike the external one though this one can either be powered by a MOLEX or SATA port cable so no power brick is needed, just don’t plug in both the SATA and MOLEX or bad things will happen. I like this added flexibility as sometimes a MOLEX cable is easier to free up than SATA and in other builds the opposite is true. To be honest, the only three issues I have with combination kit are is the x1 PCI-E interface, only one internal port and the plastic 5.25″ bay adapter. I dislike x1 adapter cards as they do limit the speed of what you can get out of the two ports, but in all likely hood this is a non-issue as the four front ports are what you will be using most of the time and they all share one USB 3.0 port bandwidth. The last issue, the asking price, is eyebrow raising especially when you consider the fact that the front 5.25″ bay adapter is made from plastic. I am not a fond lover of plastic bay adapters, and to be blunt, for the asking price SIIG really should have gone with a much more durable metal one. By themselves these issues are not deal breakers and some may not even apply to your situation but all three are issues you need to be aware of before purchasing this $100 kit. 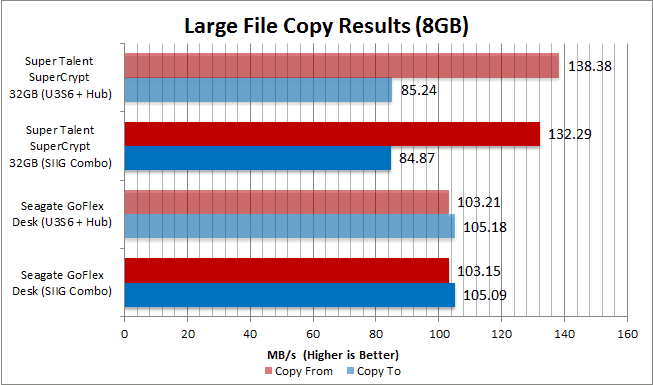 Once again, there is a bit of a performance hit by using the SIIG’s PCI Express x1 lane instead of the best of the best out there (the Asus U3S6 USB 3.0 card). To be blunt, this difference is minor enough to be considered negligible. I truly doubt that unless you had a stop watch and were moving massive amounts of data that this difference would be noticeable. To see exactly how good this hub is at its claims of being able to safely power USB devices I devised a simple little test for it: plug in a crap load of USB powered hard drives. To this end I dug out my Seagate GoFlex portable drive, a Western Digital 500 Blue inside a Vantec Nexstar 3 and a 500GB Iomega eGo. I then plugged them all in and copied files from one to the other ALL at the same time for maximum realistic power draw. I can honestly say I was impressed as that is a lot of electricity for one hub to provide, but provide it, it did and without any complaints I might add. Overall I am fairly impressed with this combination kit, as it provides a level of ease of use that is sorely lacking with most other USB 3.0 devices. I hate having to reach around the back of my case to plug in a simple external drive. Up until now the only recourse I had was to use an external USB 3.0 hub, but this comes with its own (albeit different) hassle factors. The biggest of which is having to tuck it away somewhere safe when I am not using it. Add in an external power connection being needed and the end result while easier than reaching around the back of my case, is not exactly a completely user friendly endeavor. Don’t get me wrong it IS easier, but still was far from perfect. This is why I really like this combination kit as it literally gives me all the benefits of an external hub (and then some) without any of the downsides. I know exactly where my “hub” is at all times (in my top 5.25″ bay) and I don’t have to worry about a power brick. The only minor issues I have with this kit is on the performance side of things. In fact, it’s only the adapter that I have issues with as the hub portion of this combination kit works just as well as any hub does. Sadly, while the PCI-E adapter provides VERY good performance, at the end of the day it still is an x1 PCI Express adapter card and thus not the highest performance adapter out there. Please don’t get me wrong this adapter has plenty of power, but when you deal with 200MB/s flash devices you will notice a small performance. 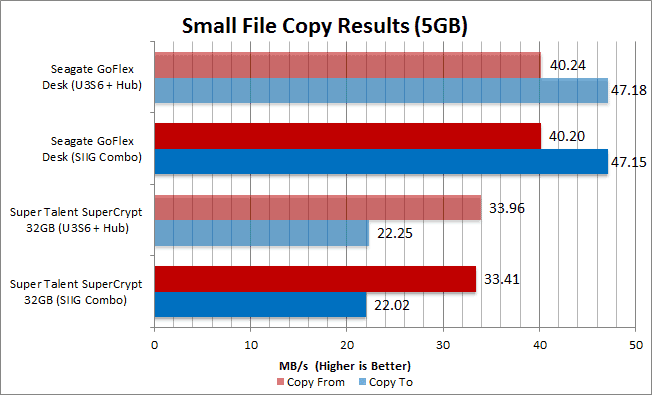 If you plan on using only portable hard drives, or even moderately priced flash drives, this is a non-issue. 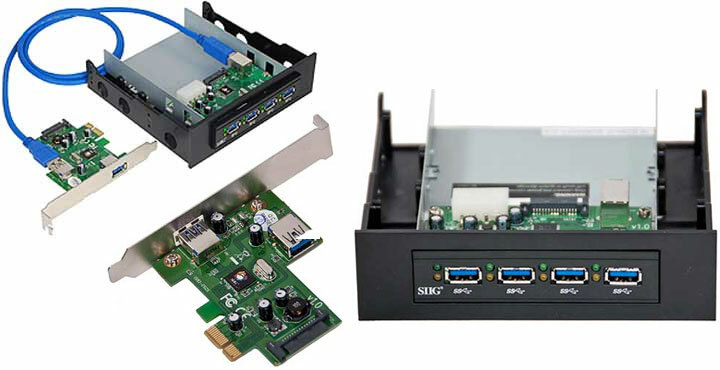 The SIIG USB 3.0 Bay Hub / Card kit will provide basically the same power as any adapters & USB hubs out there and do so while providing more ease of use than any option I have seen. In the end, I don’t mind giving up a bit of performance for the ease of use this combination provides, but before you spend the high asking price you should be aware of this issue and make your decision based on your needs.